Be more prepared for college and earn College credit! It’s never too early to start thinking about plans after high school! Belmont College offers services that can help high school students explore the many options and benefits that college will provide. College Tech Prep courses provide high-level math, science, and English skills that are required by business, industry, and labor. 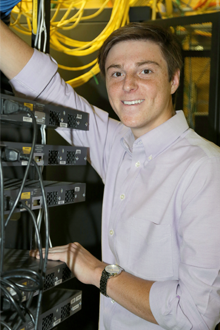 Tech Prep includes a variety of programs in information technology, engineering, industrial technologies, business, and health. Belmont, along with Eastern Gateway Community College and affiliate high schools in the colleges’ service districts form the Eastern Ohio Valley College Tech Prep Consortium. This Consortium is guided by an Oversight Committee which has representatives from business, industry, education, and labor. The purpose of the Tech Prep Consortium is to provide a non-duplicative sequence of courses starting in 11th grade focusing on the completion of an associate degree. High school students entering Belmont College that are interested in a Tech Prep program should consult with an advisor. Students can then develop an individual career plan incorporating Tech Prep coursework previously completed in high school.